Ever since I graduated college, I had wanted to collect rain and snowmelt off my roof. But seeing as how A. I was a poor college student and B. my first job out of college barely paid the rent on a 1 bedroom pad, I had to put those dreams off for a while. And now that it’s been a long (ahem) time since I graduated college, I am working on making that idea a reality. The first time I ever got to live that dream was in a home I rented in New Mexico, and since I will be moving back to New Mexico shortly, I believe I will once again be able to do it again. But I digress; for anyone interested in catching rainwater to feed their grass and gardens, this post is for you. I got very lucky when I rented that house, as there was already a 1,500 gallon cistern buried in the backyard! Since water and snow falls from the sky for free, my landlord made it so that after it lands on the roof it then runs down some pipes into the ground, providing more than enough to water the trees and plants without using any municipal water. My water bill was pretty much nada. Why should we pay for what comes down to earth for free? In exchange for a small amount of work and not much money, you could start collecting rainwater off your roof tomorrow — just in time for this hot summer weather when your plants and lawn need a drink the most! As I mentioned above, at that rental I didn’t have to do anything at all — the cistern was already in place, collecting thousands of gallons of water and keeping it ready for me to water with. I got lucky with that rental, but I plan on putting the same type of system in my own house as soon as I buy one back out west. For the setup, I had an electric pump that I lowered down into the hatch which was connected to a typical hose and sprayer nozzle. I remember being amazed at the fact that even after 30 minutes of watering, the level in the cistern barely budged. 1,500 gallons is A LOT of water, and there are people I have met that have several of these size cisterns buried on their property. Personally I would like to have at least two cisterns, so I always have plenty in case of any emergencies or extended periods of drought. Even if you don’t have the space (or don’t want to dig a huge hole in your backyard) for an underground cistern, you can still use rain barrels to collect some water. 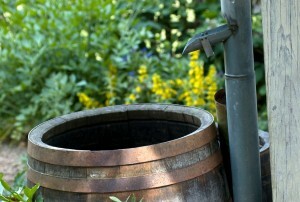 Most store-bought rain barrels are 55 gallons in size, but you can daisy chain them together to store even more water. I have seen plastic rain barrels for sale at my local hardware store for less than $40, and my local agricultural center has workshops where you can make your own rain barrel, so the upfront investment is not all that much. You just fit a gutter downspout to the top of the rain barrel, and attach a hose to the spigot near the bottom, and you are presented with free water for watering your grass or plants. Relatives of mine have $400-$600/month water bills because of how much watering their yard and garden requires; why do that when a few hundreds bucks invested one time can provide you all the water you need for free? If you are not already collecting rainwater, I recommend you do a trial set up with one rain barrel under a downspout at the corner of your house and give it a try; I think you would be very happy with the results. Ever since we moved into our new house, my father put a large barrel in our backyard and put two large plastic barrels in front. We use the large barrels to stock the rainwater for watering our plants and for washing our motorcycles. I would love to start collecting rain water! It’s on my list of things to set up….Unfortunately, it’s a long list. I think rainwater collection is a great idea. As a sustainability consultant, I really think the price of water will have to go up in price in the near future. It takes a lot of energy and infrastructure to get potable water to our homes, so it is somewhat wasteful to use that water to clean cars and maintain lawns. This is definitely something I want to do in the future! I’m very interested in reducing my water usage and saving money! Thanks for sharing!